Strange sounding, recipe, I know. But really nice flavor and easy to make! The photo above isn't the best -- I forgot to take a photo when I originally made them, so this is what they look like reheated. I would make these as an hors d'oeuvres for people who aren't picky and enjoy trying new things ~ and people who like quinoa and hummus, for example. It's not the typical appetizer. One note is that your place will smell like scallion and garlic when these bake, but the smell of those ingredients is stronger than the taste of them. 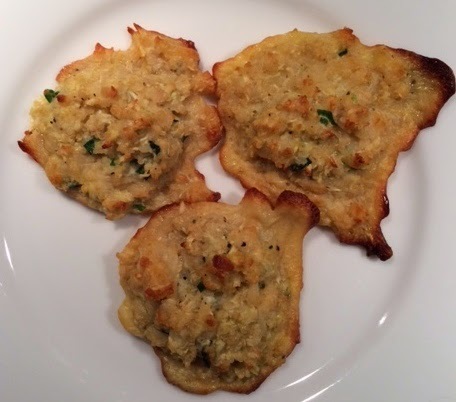 Here is the ingredient list: quinoa, cauliflower, halloumi cheese*, scallions, chickpea flour, garlic, egg, sea salt, pepper, nutmeg, baking soda, lemon juice. *Halloumi cheese can be found at specialty grocery or cheese shops.